On June 21st, we met for our 6th meeting of the year. Kimberly, our president began the meeting by a showing us a Craftsy Unlimited video featuring Sheri Lynn Wood called Patchwork Nation. Next, Kimberly gave a warm welcome to our guests and new members and wished everyone with a June birthday a Happy Birthday. Next, Susan and Kim came forward to talk about the upcoming programs. They include Anna Maria Horner visiting the guild in November for a talk on the 15th, then offering classes on the 16th and 17th. Classes will go on sale July 16th at 7 pm. Denyse Schmidt will be visiting the guild on December 6th for a talk and then offering classes on the 7th and 8th. Look for those workshops to go on sale August 15th at 7pm. All workshops will be announced, including cost via Facebook, Instagram, Twitter, email and the blog before they go on sale. The Alison Glass Kaliedoscope fabric challenge will be handed out at our July Meeting. The board is working on finalizing all of the rules and selecting judges before the July meeting and will post all of the information on the website prior to the July meeting. Also coming in July is the first PMQG Fabric Fundraiser for members to give back to the PMQG Charity program. 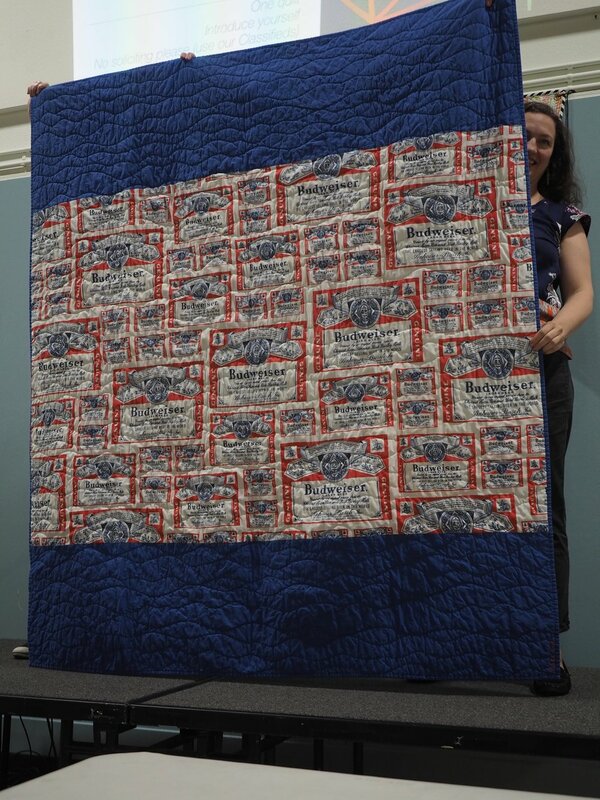 Donate any unused yardage (not only quilting cotton) or lightly used patchwork notions. Any fabric that doesn’t sell during the fundraiser will go towards the charity quilting program. More information on how to prepare will be given out prior to the July meeting. 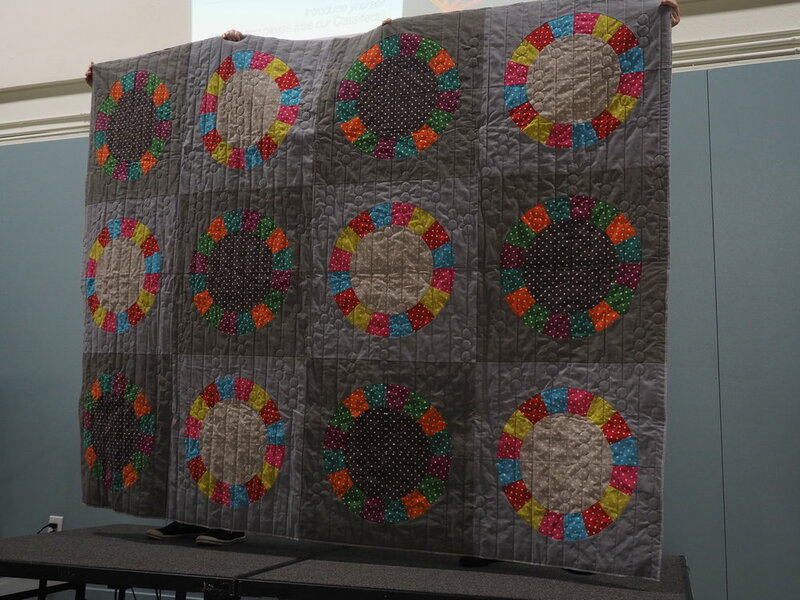 Next, Chawne Kimber gave her fantastic and moving presentation of her quilting journey. It all started during the tenure process where she escaped the stress by learning to quilt from a Quilting For Dummies book. 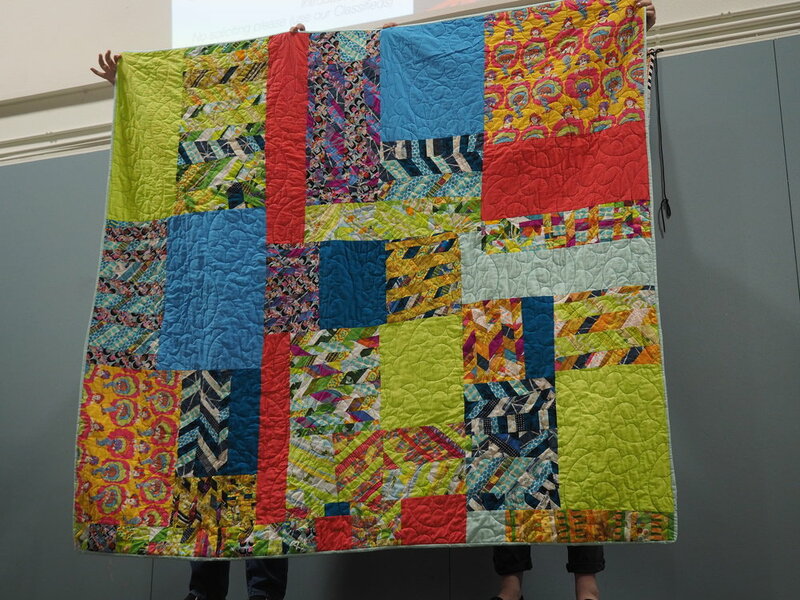 During her talk, she broke down her quilting journey into a few categories and they were identity quilts, censorship challenges and Black Lives Matter. See the photos below for her fantastic works. Many thanks to the 2017 Board for arranging Chawne’s visit. Next, Kimberly spoke about the upcoming Sisters Outdoor Quilt Show. The show is Saturday, July 14th from 9:00 to 4:00 in Sisters, Oregon. The PMQG has arranged for a bus for members to take on the 14th. If you’re interested in spending some time with your fellow guild members and not having to drive, visit the PMQG shop to buy your seat on the bus. 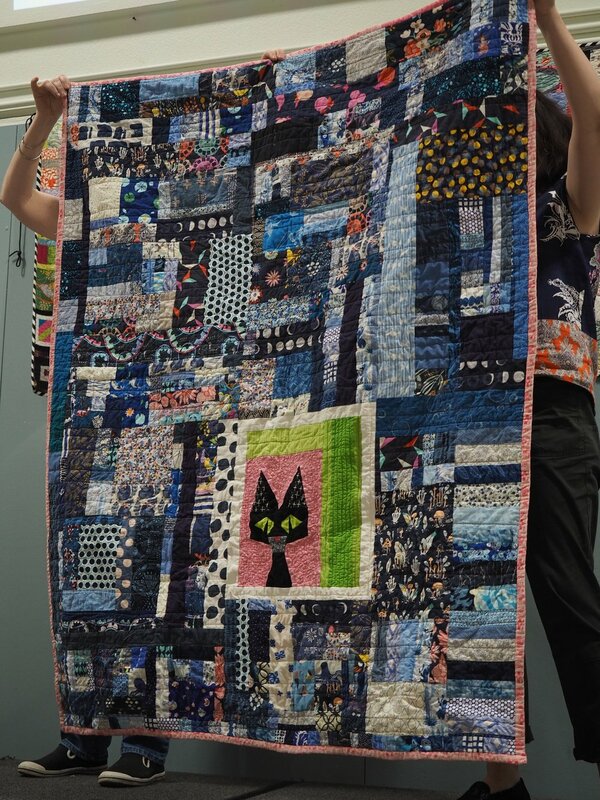 Any members that have a word quilt in the 2018 PMQG Sisters Special Exhibit, “Words, Unbound” can pick up their quilts at the guild meeting on July 19th. We also need some volunteers to be show hostesses for Sisters. Members will work in pairs for a 2 hour shift. You’ll be responsible for patrolling a small section of town and keep an eye on the quilts as well as hand out show information and answer any visitor questions. Any members interested should be prepared to walk or stand for the better part of a 2 hour shift. 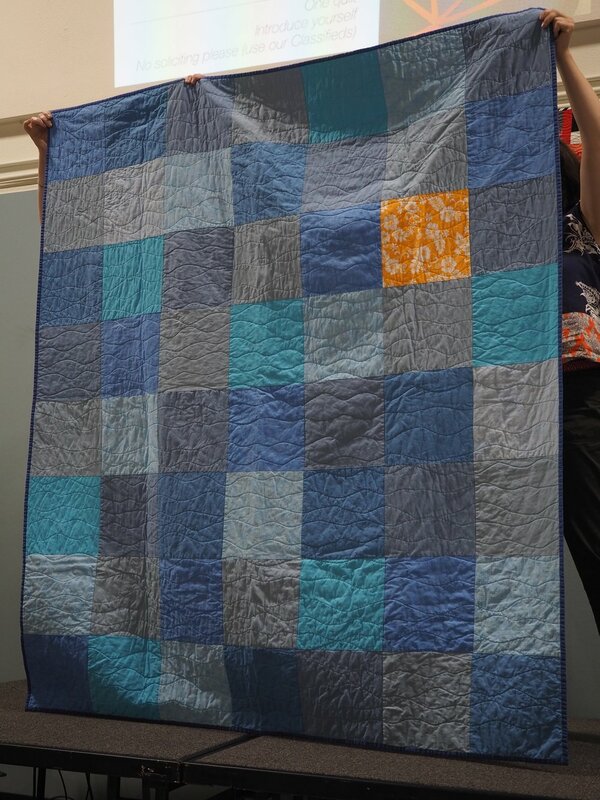 If you have a completed #PMQGSpeaks2017 quilt (or can have one finished by July 16th), contact Tamara and Tania through the Guild email, portlandmodernquiltguild@gmail.com. 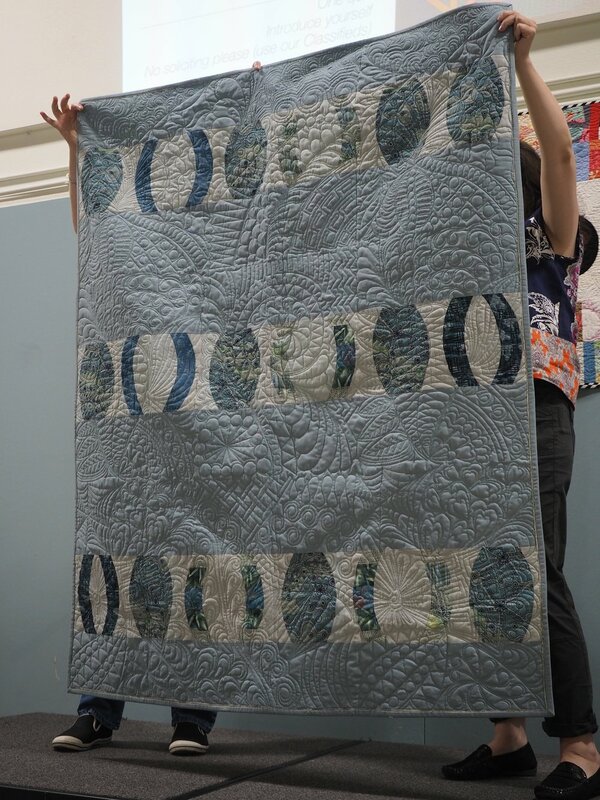 We will create a digital and print portfolio of the Word Quilts that are available to be shown and then present that portfolio to venues we think might be interested. Most venues would probably not be large enough to show all of the quilts, so they will have the opportunity to choose which ones they want to show. Matthew Stovall, our official PMQG photographer, has offered to volunteer his time to take the photos (yay Matthew! ), so they will all be high quality and consistent. Tamara plans to bring the quilts back from Sisters, so best case scenario would be for us to arrange for Matthew to take the photos prior to returning your quilts to you. We've never done anything like this before, so we are totally open to suggestions and ideas. If any of you have venues you think might be suitable for our exhibit, please let us know. 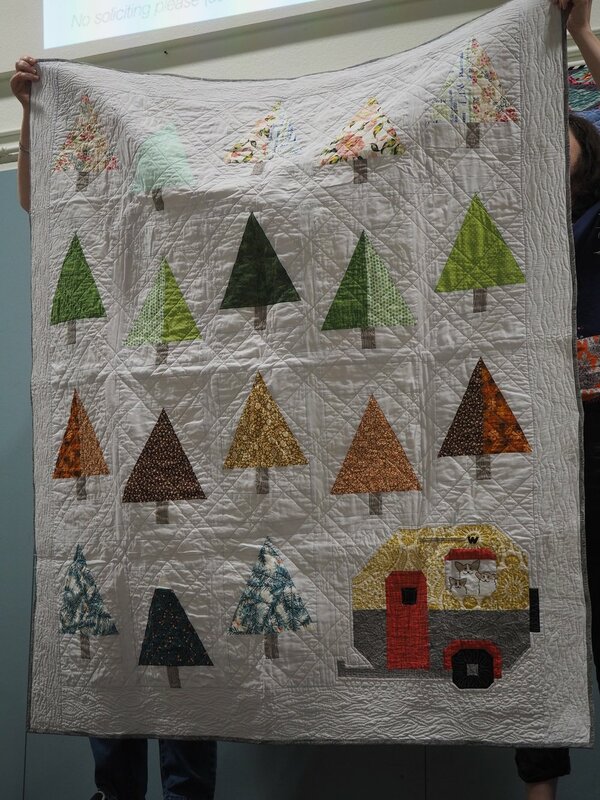 If you have a contact at a venue or at an organization you think might be interested in showing the quilts, hook us up! 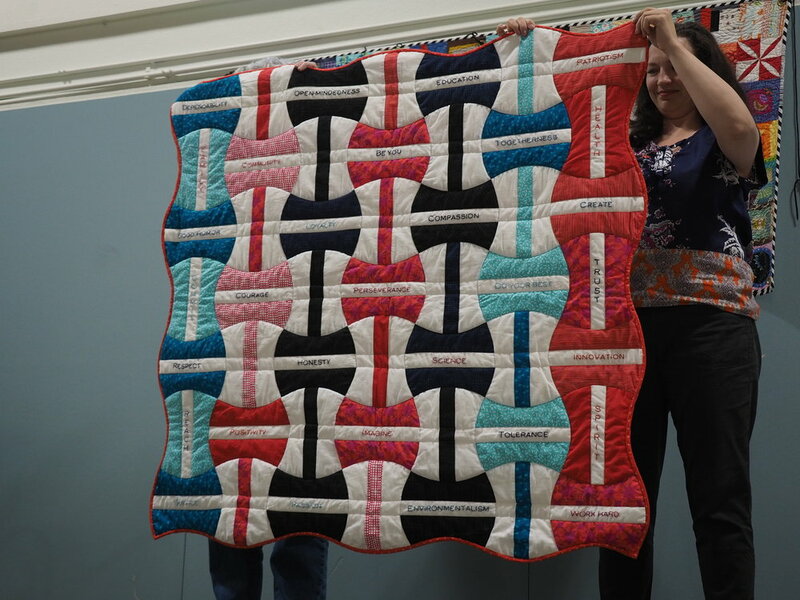 Please let us know as soon as you can whether you are interested in having your quilt be part of this traveling (hopefully!) exhibit. 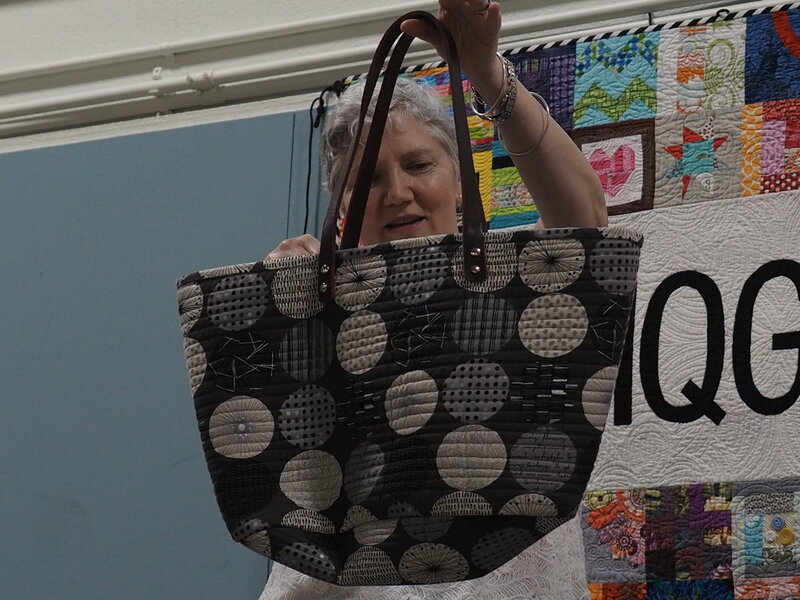 Next, Judy debuted some inspiration for the 2019 Sisters PMQG Special Exhibit. 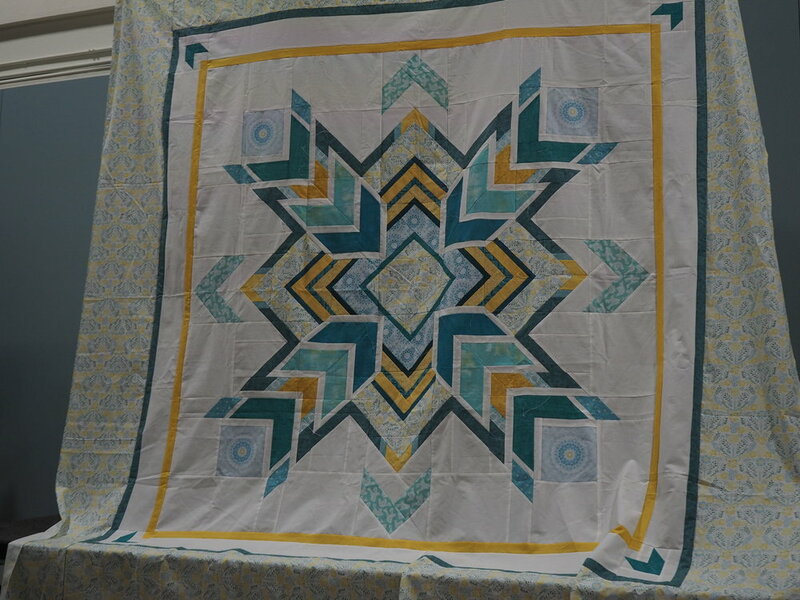 For inspiration for your quilt, visit our 2019 Sisters Exhibit web page. Next, we updated members on PMQGs Charity effort. We still need help with wonky star blocks, bindings, small quilts to quilt, and larger quilts for longarming. Be sure to stop off at the charity table at our meetings to pick up a project to work on. Note that there will be no Charity Sew Day in June due to Modern Domestic class schedule conflicts. The next Charity Sew Day will be on Friday, July 6th. We still need your help for the Charity Zipper Bag program. Any size zipper bag will do. Our quarterly program that we’re donating to is the Sno Cap Community Charities. Find out more information under our Zipper Bag Page on the website. Design submissions are due by the July 19th guild meeting and the selected designer will receive a gift by AnnMarie Cowley. To submit your design, please submit your design on the submission page here. 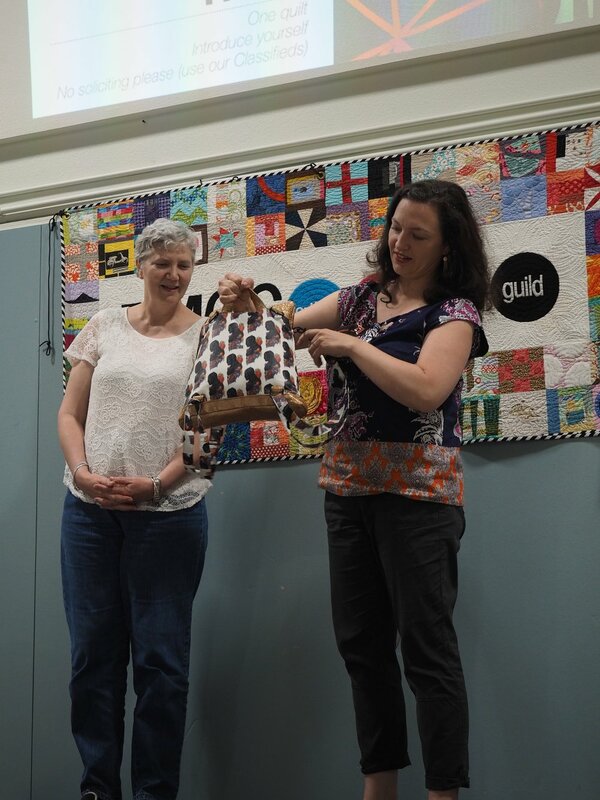 Many thanks to Cath Hall and Sam Hunter for donating the Quilt Market Bags. 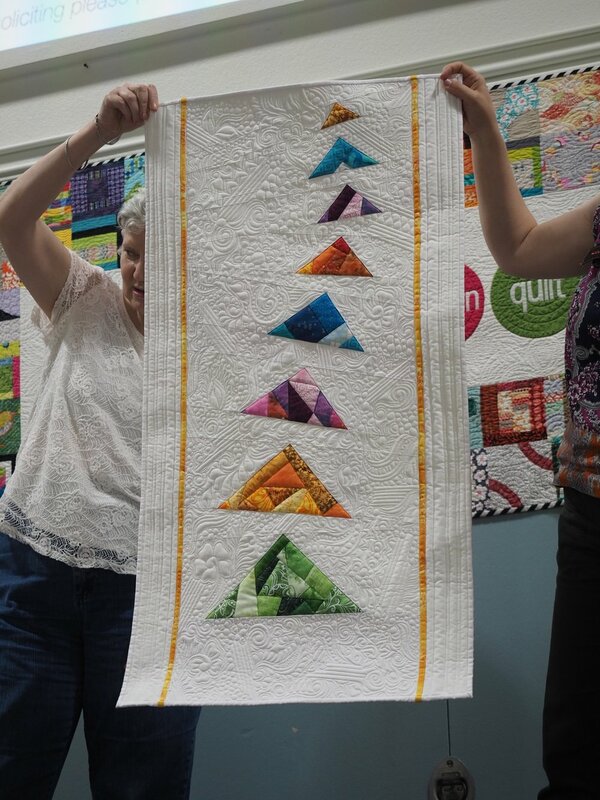 Next, Michelle debuted the June Block of the Month, the Tattersall Block. Find the directions and mood board on the Block of the Month page. Michelle is also working on a setting up a free workshop for members to work on any of the blocks of the month debuted so far. More details will be announced as soon as a workshop space is set up. Don’t forget about our #HelloPMQG #IGSummer on Instagram. New prompts are announced each Monday. We’d love to see the members participate--feel free to catch up with us at any time! The 2018 PNW Meet-Up is Friday August 10-12th. $40 for MQG Members and $60 for non-MQG Members. To sign up, visit the website. We still have some guild volunteer opportunities! We need members for the New Members and Guests Welcome Program, and Sew Day Closing September 1st and October 6th. Our next meeting is July 19th, and we hope to see you then!